Ibrox Noise: Can these XI Rangers players beat Celtic? Can these XI Rangers players beat Celtic? If one thing has been clear in recent weeks, it’s that Steven Gerrard’s present system is no longer working for Rangers. Whatever the formation has been, be it 4-3-3 or otherwise hasn’t been sufficient to overcome anyone, and Rangers’ last win was late February. The last time we can remember a run this horrific at this level was in the dark Alex McLeish days (he’s flavour of the month right now) when Rangers went 10 without winning. 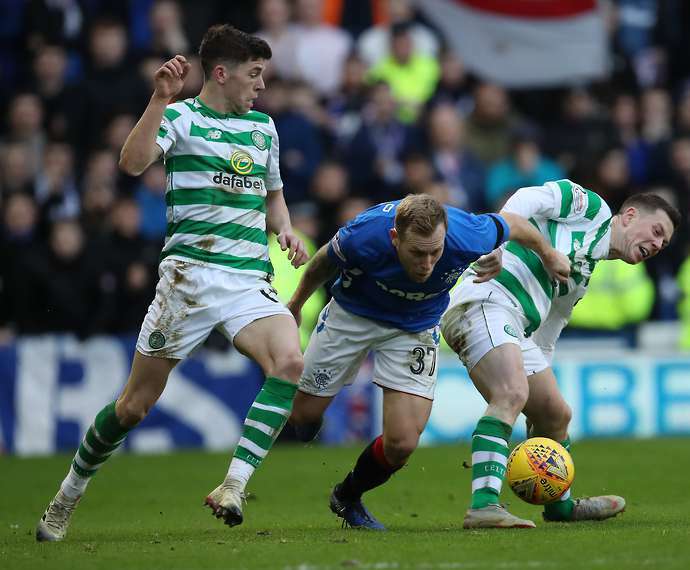 It’s not at that level yet, but the rot must stop, and Rangers couldn’t have asked for a tougher place to get a chance at redemption than Parkhead. Neil Lennon’s side have hardly been sparkling themselves, with some gritty and late-goal wins keeping their heads above water, but the ability to get those wins is what separates first from second in this league, and evidently something needs to change for Rangers to even get a point in the East End. And one of the obvious switches would be a clear revert to 4-2-3-1 with Ross McCrorie back in the side partnering Jack. Glen Kamara has struggled on the big occasions – gifting the ball away in dangerous areas against both Killie and Aberdeen – one cost a goal, one did not, and he was at it again for his country, lazily losing the ball in key areas. McCrorie might not be the composed sitter Kamara’s reputation suggests he is, but Rangers need steel and fight in midfield, components the Fin hasn’t displayed on the level of Auchenhowie’s best recent graduate. And against Celtic Rangers need to roll their sleeves up and put out the strongest physical team and formation in order to come back to Govan with more than a beating. Joe Worrall, for his faults, was outstanding the last time these two teams met, and the Forest loanee usually shows up for the big ones. Connor Goldson, on the other hand, has been nothing short of rubbish this calendar year, whatever the reason. That defence just doesn’t look solid, while Croat destroyer Nikola Katic will run through walls for Rangers – and he and Worrall have actually partnered up surprisingly well on the few occasions they’ve paired. Meanwhile Halliday must start at LB for the grit and work ethic we’ll get there – he was another stellar performer on the 29th of December. The front three behind Morelos? Kent, Arfield and Grezda. That’s right. Kent, because in form he’s devastating and one of these days that Ryan Kent will reappear. Arfield, because we pray he’s fit and we need his leadership and composure in there, not to mention drive, steel and hard graft. And yes, Grezda – he’s shown surprising ability to help out defence, and no one is going to tell us the ‘lethal combination of Tav and Candeias’ has been anything other than useless of late – Candeias has similarly attracted much ire recently and we suggest it needs a freshening up. Grezda looked lively in his international performances over the break, why not give the big summer signing a chance in this one? The other bet would be the returning Steven Davis, who has finally started to recapture a little of his form – doing it for his country as well as starting to find his feet for Rangers as well. The only quibble is Grezda or Davis. We’ve plumped for Davis. I agree 4-2-3-1 is our best option, unless he has faith in a 3-5-2 or even 3-4-3. Sorry, for me it would be Arfield OR Davis, if both are fit, but doubt Davis would play far enough forward. I also liked the number Arfield did on Brown last time. I would also be tempted, only tempted mind you, to play Kent right wing and Middleton left wing. We desperately need a couple of No 10s in the summer, which is why I would target Lewis McLeod as one of them on a free. Agree, we need to go for it. Middleton is good, nice direct attacking play. Kent on form , on the opposite wing with Morelos through the middle. Given the last few displays I would think we can expect nothing but defeat but these games can throw up all sorts of unexpected events. Surely we are due a big performance? At least we are free from the international garbage for time being! Regardless of the starting 11 I think you will find we face a highly motivated team at the weekend. They took a lot of stick for their defeat at Ibrox and we gleefully rubbed their noses in it for weeks due to the shirt down so expect a reaction. They also have the chance to effectively tie up the league title at home against their biggest rivals. There can be no better motivation. I doubt if we could stand up to it. I can only pray for a result. But judging on our performances this year, I fear the worst I'm afraid. We are leaking stupid goals and there is a terrible drought up front. So no matter who plays and what formation we play, if the players decide not to turn up and hide (again), then we will get well and truly pumped. Popcorn teeth will have them wound up into a frenzy and they will be strong, fast and physical,, something Gerrard has failed to instill into our team this year! To get a result, we need a huge chunk of luck, something those feckers have had in abundance this season! !